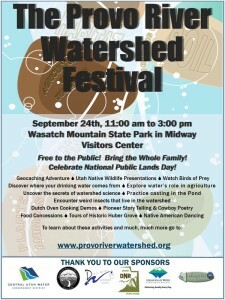 Central Utah Water Conservancy District » Come celebrate the Provo River Watershed! Once you know everything that goes into keeping the Provo River Watershed a source of clean and usable water, you’ll find even more reason to celebrate the region at its annual festival. From 11 a.m. to 3 p.m. Saturday, Sept. 24, the Wasatch Mountain State Park Visitors Center in Midway will become Party Central. You and your family will enjoy a variety of hands-on activities that tap into the watershed’s many faces at the Provo River Watershed Festival. Listen to music while enjoying a bite from the Waffle Love, practice your casting with the Utah Division of Wildlife Resources and don’t miss a guided a visit from H2Joe. Admission is free. The river was originally called the Timpanoquint by the Ute Indians. The word means “water running over rocks,” and there’s a landmark in the mountains to the north, Mount Tampanogas, that still carries the name. Among the biggest threats to water quality today is nonpoint source pollution. This is caused by improper disposal of motor oil, run-off from lawn and garden products, and discarded animal waste. But it is balanced by a council that works diligently to promote conservation, monitor invaders such as zebra mussels and preserve wildlife habitat. Their efforts have paid off in creating a recreational mecca as well as a water source for Utahns. Historic Huber Grove is a homestead with a mystery. Swiss immigrant Johannes Huber and his wife, Maria, were early settlers in Utah who built their family’s cabin and planted an apple grove that, for more than 125 years, still produced fruit! When you consider that most apple trees stop producing after 15 years, it’s a mystery that some experts attribute to the region’s extraordinarily cold winters. Come join us and bring the family. We’ve pulled out all the stops—falcons, anyone?—to make it a day you’ll long remember!